Clinical Psychologist Dr. John Kline, once again puts his music where his mouth is in the newly released CD, entitled, "I of the Storm." Kline's eclectic blend of Progressive Rock, Metal, Jazz, Blues, Ambient, and Celtic influences has been described as New Age with Edge, but it has also been said that it is better described as "Edge with a side order of New Age." With up-lifting and spiritual qualities, this CD is by and large more up-beat than his previous efforts, with occasional ballads, mellow acoustic (including a cover of Take Five) and semi-ambient pieces. Don’t let either "New Age" or "Edge" references scare you away. In either case, Kline gives us an artful blend of melodies, textures, and moods, peppered with blazing and passionate acoustic and electric guitar work. With more of an emphasis on the acoustic guitar than previous efforts, the compilation skillfully intertwines energetic, bold musical statements and passionate, evocative ballads. Kline has been nominated for numerous awards on the internet site Garageband, and several years ago he was named Most Versatile (two years in a row) and Prowar Champion on Guitarwar. His 2006 CD, Instrumental Conditioning has enjoyed a brief stint as the #1 top-rated instrumental rock album on Rhapsody, and earned him a spot on Guitar9 Records "The Undiscovered." Reviewers have compared his fluency and style to iconic guitarists Steve Vai, Joe Satriani, Pat Metheny, and Eric Johnson. In addition to his formidable musical dexterity and inspired creative breadth, Kline handled all of the composition, instruments, programming, engineering, production and prototype mastering in his growing and evolving cottage industry home recording studio. 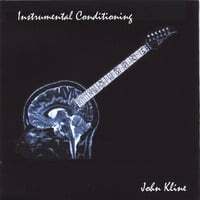 Since his last release, Kline has added drums, harmonica, recorder, and violin to his growing list of dilettante competencies. I of the Storm is available in CD and MP3 format through CDBaby, as well as through many major online distributors, including Amazon, Rhapsody, iTunes and Napster. Pop it in your CD player, do that thing you do that makes you relax, smile, and enjoy the ride. I of the Storm is now available at CD Baby in both digital and CD formats. It will soon be available at many music download services. Listen to Jonh Kline Rhapsody / Radioindy Radio! Richly-textured melodies, peppered with blazing and passionate lead guitar, showcase this compelling blend of Rock, Jazz, Blues, and Celtic flavors ... New Age with an edge.